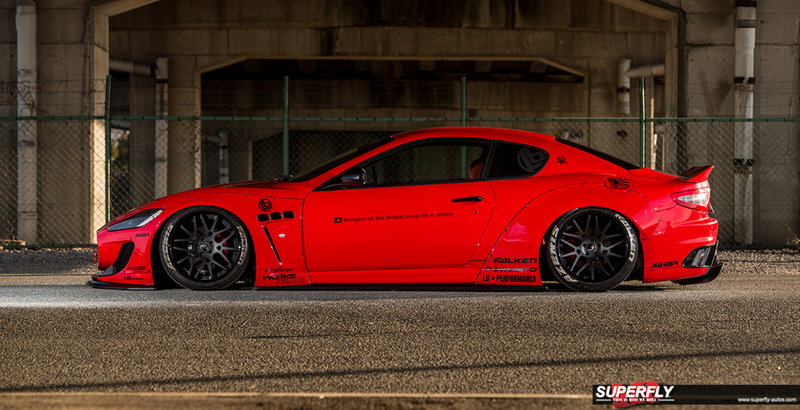 LIBERTY WALK TAKEOVER CONTINUES AS THEY ADAPT THEIR GROUND-BREAKING BODYKITS TO MORE EPIC MACHINES. It’s hard to argue that these days, Maserati is making some simply fabulous cars. But what though, if your shapely GranTurismo just doesn’t cut it for you? What if that subtle Italian styling just isn’t enough? In that case, you need to look further east, where Japanese internet breakers Liberty Walk have unveiled their traffic-stopping new kit for this superb car. As you might expect of a firm that’s built its reputation on raw aggression and over the top styling, the new kit is not for the faint hearted! Maseratis fitted with the firm’s new Works kit will have the power to stop traffic, slacken jaws and make even the loudest and most in-your-face of supercars cower, so it’s ideally suited to this stunning slice of slick Italian attitude and owners that don’t want a ‘me too’ motor. Liberty Walk’s all new Works kit is formed from high grade glass-reinforced plastic (GRP), a material that’s malleable enough to be formed into wild, extreme arches, scoops and intakes, yet strong enough to shrug off the hustle and bustle of modern day driving. 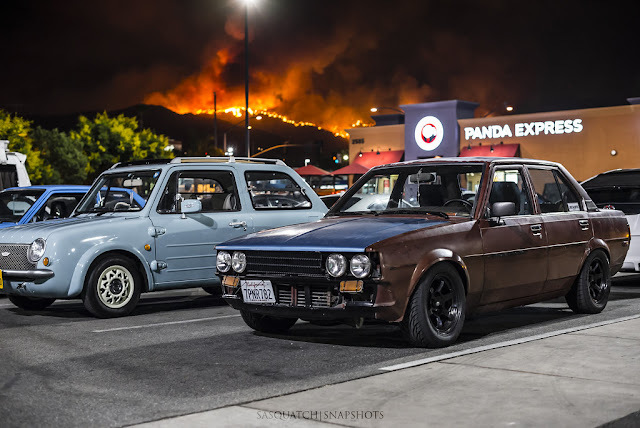 The kit features bulging arches, a jutting front lip, and a mean-as-hell ‘ducktail’ spoiler, and an impressive rear venturi design -enough to gift this already menacing car with levels of latent aggression that are hard to put into words. The kit is also available piecemeal, allowing Maserati owners the option of buying the whole lot, or replacement parts if needed. A carbon reinforced plastic kit is also available for those looking for the ultimate in styling, strength and lightness. 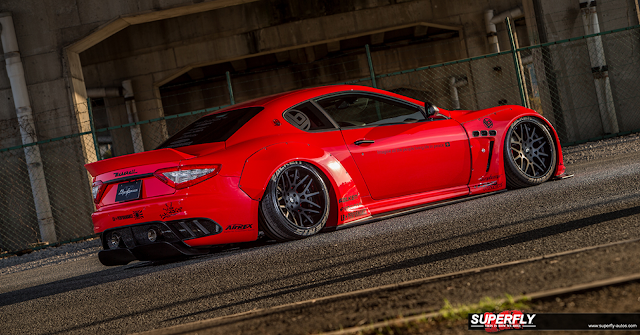 The kit embodies all that’s great and good about Liberty Walk, and it has been painstakingly developed to fit the big Maserati precisely, accentuating its arches and aggressive styling traits. 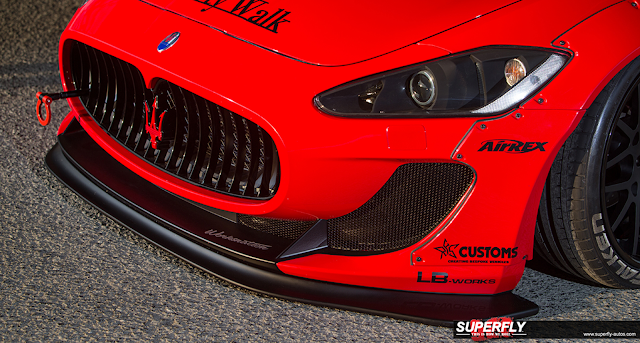 The complex design process employed in the creation of all Liberty Walk products ensures that fitment should be a straightforward affair for any trained bodyshop, while the end result is all but guaranteed to stop traffic and draw admiring glances left right and centre, particularly when paired with adjustable air suspension for a perfect stance coupled with a practical driving experience. 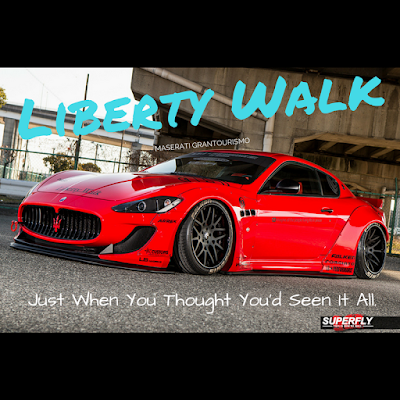 Liberty Walk’s latest creation can be fitted to all specifications of GranTurismo – rendering the recipient vehicle an instant internet sensation. 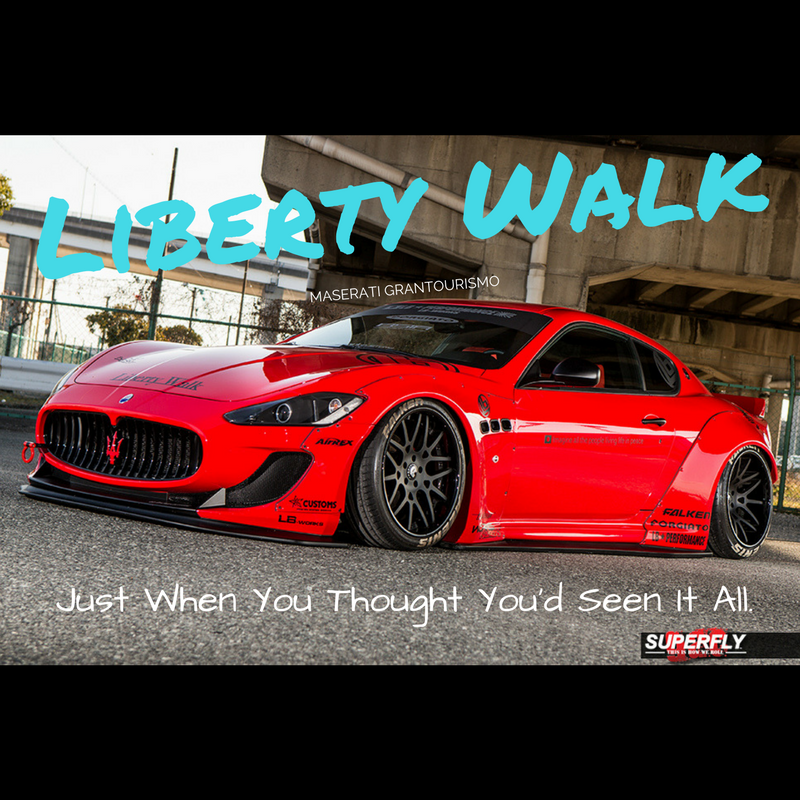 If you really want to drive something truly different, Walk Free!